When I got engaged, I said I wanted a simple wedding. I wanted immediate family only, I wanted to wear my mother’s dress, I wanted it outside, I wanted minimal decorations, and I wanted flowers just for me and S.
Turns out, if you want pictures, you have to hire a photographer. If you want to get married outside, you have to find property that is available on your wedding date. If you want your immediate families there, you have to make sure that they can all make that date – and be sure to ask very, very nicely, as some of them had to drive 14 hours from Tennessee to Texas. If you want to wear your mom’s dress, it has to fit you and it must be clean. If you want flowers, you have to decide what color, how big, which flowers. You have to decide on your hair, nails, makeup, shoes, rings, vows, officiant, date, color scheme, ceremony schedule, which things you want done professionally, and a back-up rain plan. Did you get tired just reading that? I did. 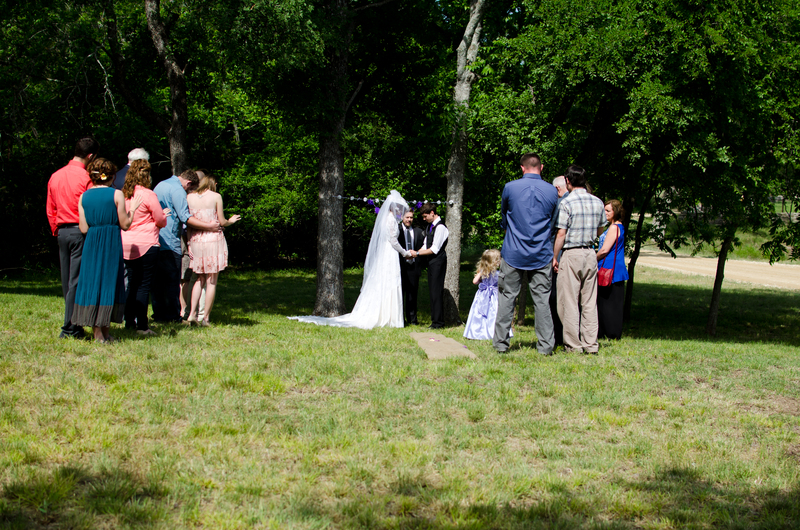 And really, y’all, I wanted a simple wedding. If you want to decorate your house ‘simply’, there are about a million steps and a million ways to do it. Everybody seems to be after simplicity. But honestly, for a word that means “easily understood or done; presenting no difficulty”, there sure do seem to be a lot of complications. In my own exploration of ‘simplicity’, I have found that the reason it is so elusive is because it has more to do with prioritization than anything else. To simplify, we must first determine what is important. In this world of busyness and technology, it can be hard to remember (for instance, Facebook can seem kind of important. I assure you, however, it is not). When you think about it, I bet the things you enjoy and value the most are the ‘simple things’. Quiet moments spent with loved ones. Accomplishments in something you have been striving for. Exploring something new. What are your happiest memories, and what do you think the reason for that happiness was? Let’s narrow down our priorities and keep life simple.